Senior-level executives and high-potential professionals who wish to accelerate their career development in the area of modern finance. Institutional investors, family office professionals, and private wealth advisors to ultra-high-net-worth individuals and families. Business unit leaders seeking new avenues for growth within an existing product line, service, or geographic territory. New and current CEOs of large, publicly traded companies. Financial professionals that have already submitted an application to the Investments & Wealth Institute. Senior-level executives who need to improve their ability to make financial decisions that generate value. Senior-level managers who are responsible for influencing business decisions across marketing, finance, operations, and strategy; those who are responsible for data-science teams. Marketing executives who work in web strategy or online strategy development and social media. Non-marketers who need a deeper understanding of digital marketing. Executives with some experience in formulating strategy from diverse industries such as manufacturing, medicine, financial services, and law. This program is designed for financial advisors and managers of family offices for high-net-worth individuals/families based in Latin America and Miami seeking to learn how to guide their clients in developing and maintaining family governance systems to help preserve the family business, wealth, and family harmony for multiple generations. Financial advisors and managers of family offices for high net-worth individuals/families based in Latin America and Miami. Learn how to use financial data to make business decisions and to evaluate your firm’s performance. Examine core concepts of finance and accounting in a straightforward, easy-to-grasp manner. Business owners/entrepreneurs and senior business leaders whose professional success will be complemented by focused professional business development. Senior executives with more than 15 years of work experience managing teams. Designed for physicians and executives who work for health care organizations or in academic medicine. Participants include clinicians, scientists, and other health care executive leaders. Create new business models, launch new products, improve customer experience, and open new markets. With an “Innovation Toolkit,” you can design a flexible innovation process that lets your company quickly adapt to, and profit from, changes in customers, competitors, or markets. Designed for established or aspiring leaders in Academic Medical Centers and the Health Care Industry. Participants include, but are not limited to, clinicians, scientists, and other administrative and executive leaders. Corporate executives, government and military leaders responsible for managing technology initiatives, emerging business portfolios, leading innovation, or tasked with creating new business models. Mid-level managers from operations, finance, marketing and human resources in the building and construction industry. Mid-level to senior executives who are tasked with improving overall business processes for medium to large corporations. Senior-level HR executives, business unit and general managers who need to build analytics capabilities, improve the quality of talent, and acquire better tools for managing and leading organizations. Gain new approaches for achieving maximum value and increasing your firm’s bottom line. In this program, you’ll learn about the specific challenges facing various industries, including pricing new products, short lifecycle products, dynamic pricing, and bundling products and services. This program, designed specifically for wealthy investors and financial advisors to high-net-worth families in Latin America, will offer objective, practical insights on how to manage the assets of families with substantial wealth. Company founders, C-suite executives, board members, entrepreneurs, and other business leaders who are responsible for accelerating growth. Learn to accurately assess the competition, design a compelling strategy, leverage your firm’s capabilities to full advantage, and obtain necessary resources through alliances, acquisitions, and internal corporate ventures. Senior HR professionals, high potential HR managers, and HR and talent management consultants who are preparing for larger roles in global organizations. HR executives (including CHROs), academics, researchers, educators, or talent management consultants. Senior-level executives in banking as well as executives in other industries who have finance responsibilities. Angel investors, general and limited partners, and entrepreneurs seeking funding for their companies in their early stages of growth. 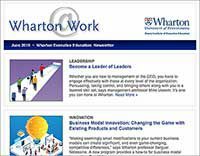 This program offers a lifelong network of senior executives, Wharton faculty, and leading experts that provides continuous critical knowledge, challenges to the status quo, and unparalleled decision support. 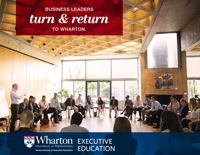 The program’s unique format – short, global master classes and a continuously linked community of experts – helps senior leaders to meet the current and future business challenges of accelerated, disruptive change.